From day one, Gemini has required 2FA using the Authy service for all accounts. Starting on March 13, 2018 we will be enabling a new Authy feature for added security while performing sensitive transactions: Authy push notifications. Most consumer-grade authentication systems operate at the level of sessions. Users provide their credentials — which may involve multiple factors such as a password in conjunction with a short-lived, one-time passcode. This initial step creates an authenticated “session” lasting for a fixed duration (e.g., one hour). During this time, users are allowed to browse around the site and use various features. After the clock runs out, the session reverts to an unauthenticated state, requiring users to prove their identity once again. One shortcoming of this model is that after initial authentication, any number of actions are allowed within the authenticated session. Transactional authentication improves on that model by tying the authentication to a unique action. “Unique” being the operative keyword here: asking users to type their password one more time or even enter another 2FA code is not sufficient. Without knowing what will happen after completing those steps, users are effectively approving some action which may not be what they had in mind. At this point, the attacker can turn around and use those credentials (quickly, before the 2FA code expires) to login to the legitimate website to impersonate the legitimate customer. Requiring additional 2FA codes to perform sensitive actions such as authorizing a payment is not sufficient to mitigate this. The phishing site can adjust its tactics, feigning an error after collecting the initial 2FA — even though it is valid and used by attacker to login — and trick the user into giving away a second 2FA code to use for authorizing the subsequent action. The root cause of these problems is lack of context about the action being approved: the user believes that providing a 2FA code or pressing a button will lead to one outcome while the adversary has carefully altered the setup to trigger something else entirely. What is required is an out-of-band channelto verify the intended transaction, independent of the original device where it is initiated. Some cryptographic hardware tokens feature a trusted display and user-interface with physical buttons to confirm transactions. That display is driven by the token and cannot be manipulated by the machine the token is attached to. Several Bitcoin hardware wallets have a display for confirming the destination addresses on transactions. Even if local malware running on the PC sends a different Bitcoin transaction for signing — as malware in the wild was discovered to be doing by manipulating the clipboard — the user has an opportunity to detect this substitution because the display cannot be manipulated. A more mainstream example can be found in NFC payments using a smart-phone. While standard credit card payments (even with chip cards) involve blindly trusting the point-of-sale terminal to charge the expected amount, mobile wallets can first display the amount requested and obtain confirmation from the consumer before proceeding with the payment. 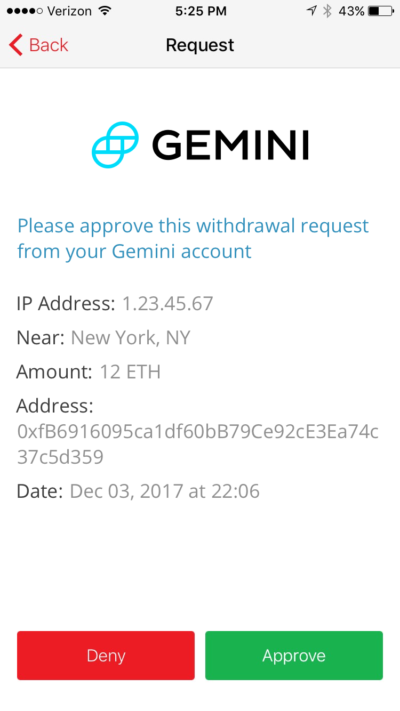 At this time, for customers who are already using the Authy mobile app, Gemini will require push notification approval for all crypto-currency withdrawals — no action is required to opt-in to the additional level of security. Gemini strongly recommends all customers to use the Authy mobile app and cautions against relying on SMS for two-factor authentication.